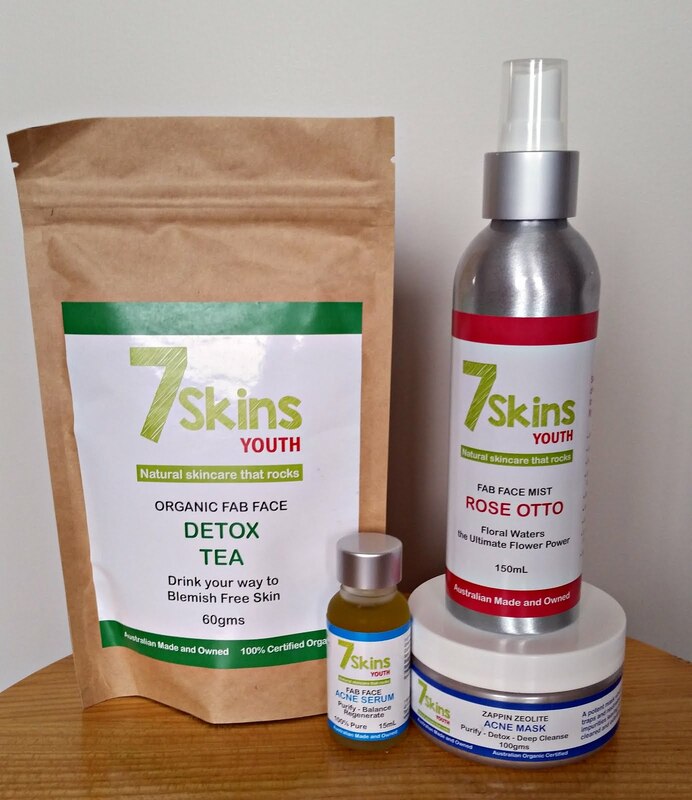 I was recently contacted by 7 Skins Youth to see if I would be interested in trialing some of their skin care range. When I jumped on their website, I learnt that they were all about natural ingredients and avoiding nasty chemicals. 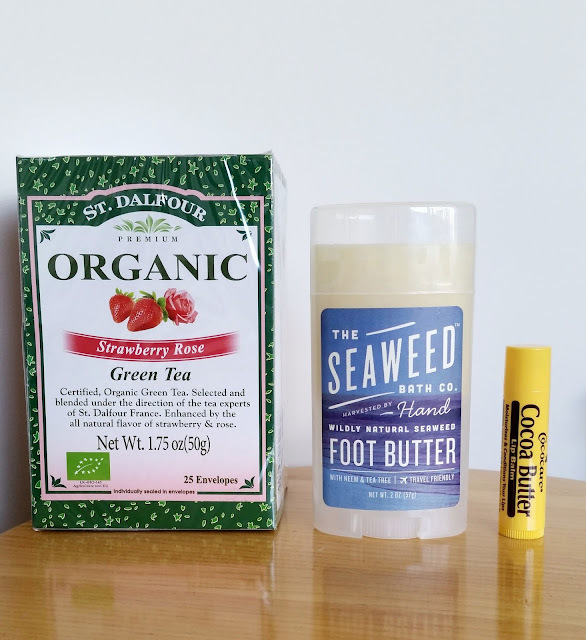 As I do really enjoy organic and natural products, I was very keen to try out their products. 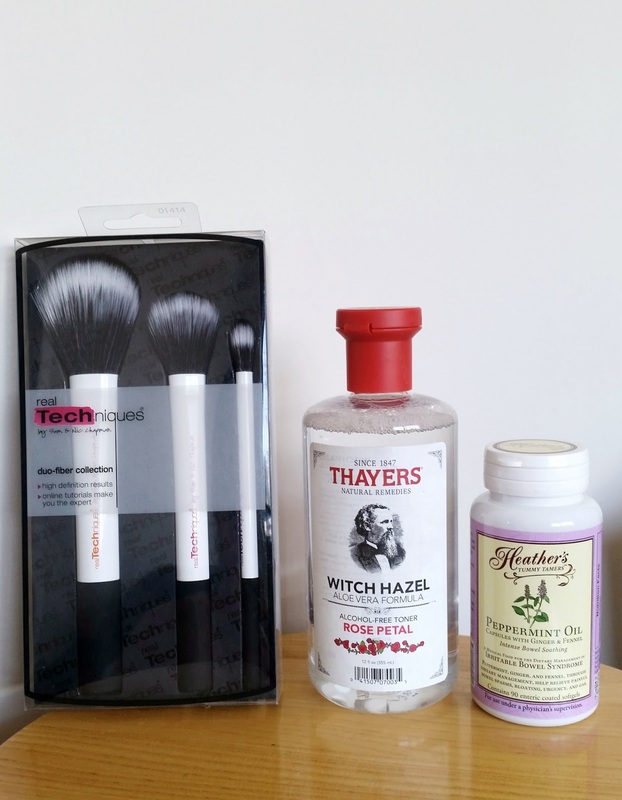 I received a range of products including a skin detox tea, acne serum, rose mist spray and an acne mask. On first impressions, I was impressed by the simplicity of the packaging. I also had a browse of prices on their website and they are very affordable. Already off to a good start! Now the next thing I wanted to address are the ingredients - are they actually natural, as they claim to be? So this is what we have in the detox tea. Whenever I see the words detox, it makes me nervous. Most detox teas contain laxatives such as senna. I certainly did not want that effect from a tea. But this is designed for skin cleansing/purifying so I was hoping it didn't give me tummy problems. I was pleased to see that this tea is 100% certified organic and is indeed all natural! On their website, you can read some detailed information about the role of the ingredients, but in a quick summary, these ingredients work together to detox and cleanse the liver to improve skin health. I found it to be a very light flavour. A slight hint of lemon and I could only just detect the licorice root. I have been swapping my evening black tea for this and I think by reducing my caffeine intake, its been helping me sleep a bit better. It's hard to say whether this helped my skin because I didn't really notice any changes, but improved sleep quality is always a good thing! Now this is the acne serum. Again, a very impressive list (what is watermelon seed oil? cool!) with overall benefits including anti-bacterial and anti-inflammatory effects, balancing of sebum production and helping skin repair. 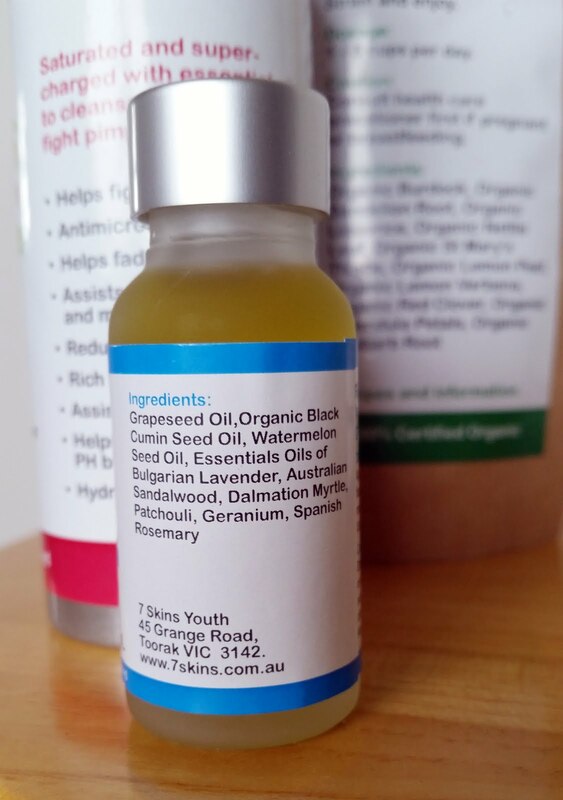 I found this to be slightly heavier than rose hip oil, so a little goes a long way. The idea is to use it on problem areas, but it can be used all over. As it is a little on the heavy side, I chose to apply it twice daily on my temples - I don't know why, but I've always got little bumps around that area and thats where I get blind pimples too. It has a strong scent which to me mostly smells like the lavender oil. It is easy to massage into the skin, but it does take some time to absorb, so sometimes I skip this in the morning because I don't want oils eating through my foundation. That aside, I think this is a very handy little product to have in your skin care arsenal. I have found less bumps and also less blind pimples. Yay! This is the rose face mist. Obviously, the main ingredient is rose, and it does indeed smell quite rosey. 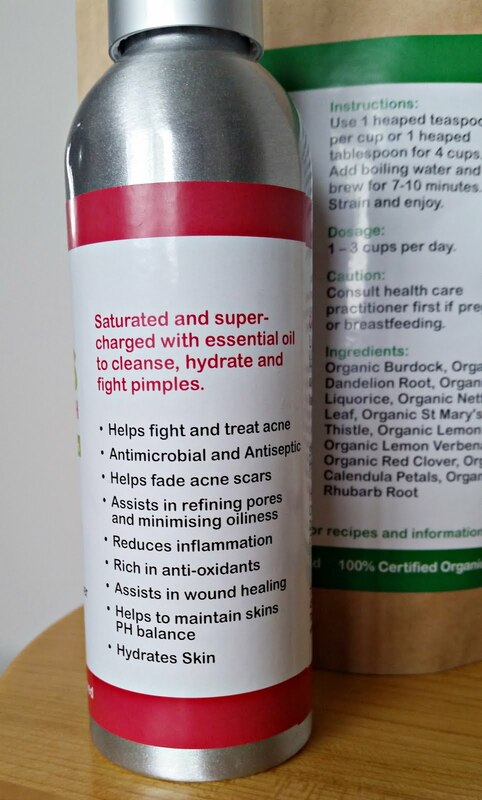 Here is a list of included benefits listed on the back. It can be used in a few different ways, including as a cleanser, toner, or just a general refreshing spray. I like to use this after taking off my makeup on a hot day and spraying my face as a way to cool down, but also treat my skin. I have never been interested in toning sprays/mists but now I'm thinking they're pretty nifty to have around. Lastly, the acne mask. 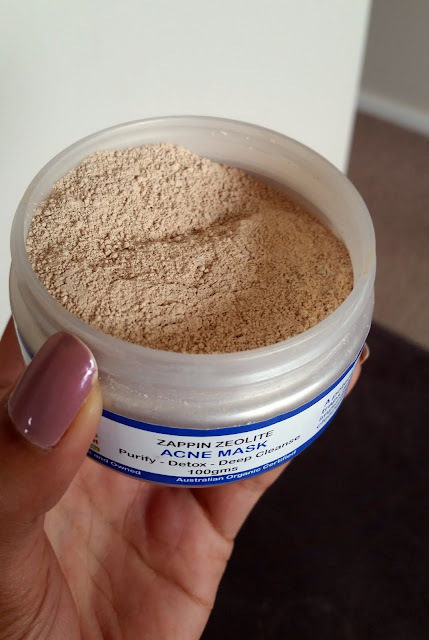 The ingredients in this include zeolite and french green clay which cleanse, purify, refines pores as well as a whole other list of benefits. The idea is to add a bit of water to a teaspoon of the mask, form a smooth paste and apply to the face, allowing to dry, before washing off. It can also be used as an exfoliant, or a spot treatment, but I did not try either of these methods. I found the mask to try quite quickly and it made my skin feel very refreshed a smooth. I definitely enjoyed using this, which is not surprisingly, because it is a 7 Skins best seller! Also, their website claims you can use the leftovers to sell as zoo poo. Love it! And that brings me to the end of my review. Overall, I think these are fantastic products and would be great for someone who is looking for an affordable and natural skincare range. I think the price point would make it a great option for teenagers who are exporing skincare options. If I had to pick a favourite product out of the ones I trialed, I would say the mist based on its versatility and how refreshing it feels on the skin. 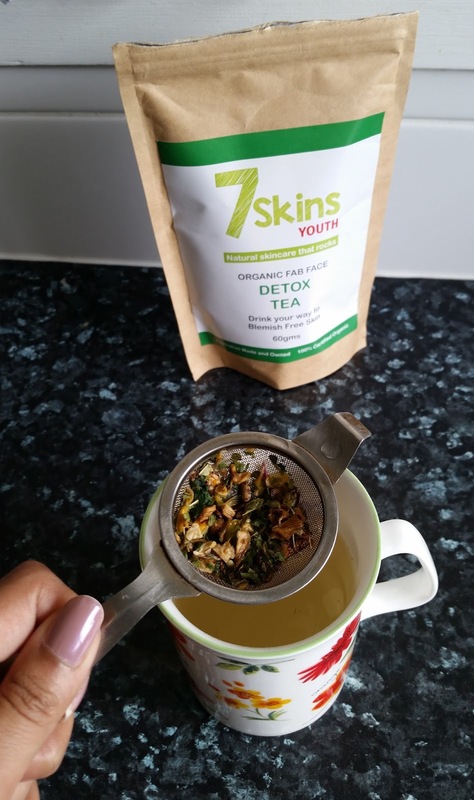 Have you tried any products from the 7 Skins range? I have been wanting to invest in a contour brush and RT is my go-to brand when I need new brushes. And the place to buy them from is iherb, as their prices are usually much better than what you'll see at Priceline. I haven't used this yet but I'm sure I won't be disappointed. I've never been one to use toner - I'm lazy and in the past, toners have always dried out my skin and made it feel tight. 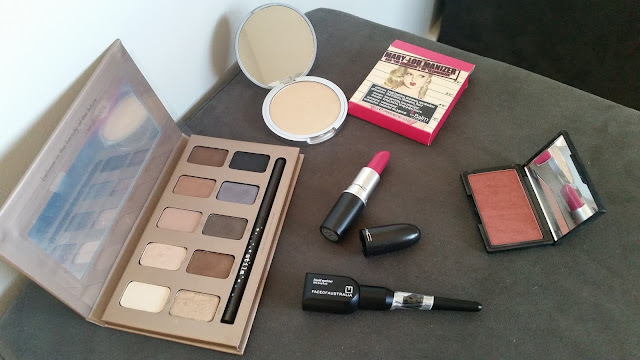 I read some rave reviews on Makeup Alley and that's why it ended up in my cart. So far, so good! It is very gentle and not at all drying on the skin. In fact, I even forgot to moisturise afterwards one night because my skin felt refreshed and soft. It does smell fairly strongly of rose petals but I think it smells pleasant. If you've had issues with toners causing dryness, I'd give this one a go - it's alcohol free and the rose petals are said to be moisturising. If you're an unfortunate soul like myself who suffers with IBS, you'll know how annoying it can be. I've had quite bad bloating and cramps lately so I thought I would try this. Peppermint oil is an anti-spasmodic which reduces muscle spasms and cramping. This also contains a few additional soothing ingredients such as ginger and fennel oil. I haven't tried this yet because I've had heartburn intermittently for a few days, but I am hoping this will help my tummy. I love tea! Especially rosey flavoured ones. Strawberries are my favourite fruit, so of course I had to try this. It is delicious, and organic too! What an interesting concept - it looks like one of those solid deodorant sticks. This is actually really handy because you don't have to use your hands in the process - just rub all over! It smells like a mix of cocoa butter with peppermint. I have been using this after my night time shower and then popping socks on before jumping into bed. Pretty pleased with it so far. I bought this because I wanted to make my cart up to $40 to get free shipping. Nothing particularly special, it is fairly moisturing, smells okay and that's about it. So that was my haul for this month. Are you an iherb fan? I'd love to hear about your experiences! Hands up who loves Sukin? I certainly do. Not only are their products organic, they're also priced very well. So when their new super greens range came out, I was pretty keen to try out some of their new products. If you know me in real life, you'll know that I'm always eating kale in my lunch but I don't actually enjoy it that much. Its good for you, so many nutrients etc...I try and be good to my body, even if I don't like what I'm eating all the time! So if you're anything like me, this is a perfect compromise. It incorporates the essential nutrients from ingredients such as kale, chlorella, jojoba, spirulina and rose hip (just to name a few) in a way that works really well (and means I don't have to eat kale). The first one of these I purchased was the scrub. It is fairly creamy and has a few beads in it, certainly not as abrasive as some of the harsher scrubs out there (St Ives, I'm looking at you) but still works a treat. It smells great too, like pineapples! I use this twice a week. The serum was next, after I read rave reviews about it. It comes in a pump and I use about 1-2 pumps for my face. It's very liquid-y and light weight, with a refreshing scent. It absorbs super quickly, in fact, by the time I've moved on to the other side of my face, its already absorbed. This is perfect as I am usually too lazy to wait much longer before moving onto the rest of my routine. And last of all was the masque. 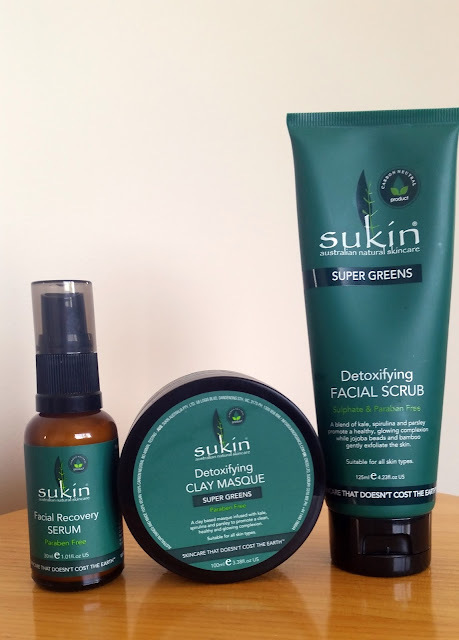 I am a big fan of the other Sukin clay masque so I had to try this. It's a very smooth clay and works just as well as the other masque. And it smells lovely too. So far, I think this range is excellent for the wannabe greenie who wants to benefit from superfoods in a way that is more pleasant than consuming them! Have you tried this range? Let me know your thoughts! Today I'm reviewing some Veet products, just in time for summer. I'm the kind of person who uses a variety of hair removal products including razors, an epilator and depilatory creams. So when I was offered to trial some hair removal creams, I couldn't say no! So my first memory about depilatory creams is from my early teen years - I remember that they smelt really bad, stung a little and didn't really work all that well. Luckily times have changed! First I'll discuss the spray on...I really like the idea, it makes it much quicker to apply the cream and means you don't have to worry about spreading it evenly too much. Sadly, I find that it is difficult to use because the spray top requires a lot of pressure to dispense the cream! However in saying that, it does work really well. It only took 5 minutes to remove finer hairs (on my knees, where I don't like to shave) and I used the pictured spatula (which came with both products) to scrape it away. It makes cleaning a whole lot easier! As for the cream in the tube, I definitely preferred this one. Easy squeezy and it actually smells nice too. It is a lightweight cream that spreads easily. And did I mention it doesn't stink? Again it only took about 5 minutes to remove hairs. The end result, after washing the area - soft, hair free skin. No redness or irritation! Excellent! 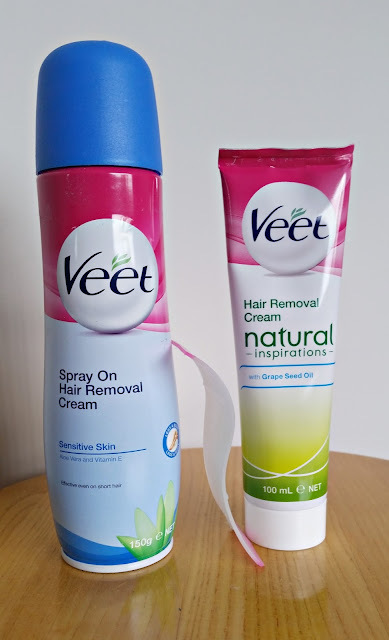 So a few tips regarding these products - 5-10 mins is all you need; 10 minutes to coarser hair but don't leave it any longer as it may cause irritation. As always, good to do a patch test first (I never do but you should!). Spring is here, and we all know what that means...wedding seasons! I had the pleasure of attending of attending a wedding for my two friends from high school. It feels like only yesterday we were in year 7 talking about how gross boys were. How times change! Anyway, here is what went on my face...I kept it pretty simple because it was a fairly casual wedding. 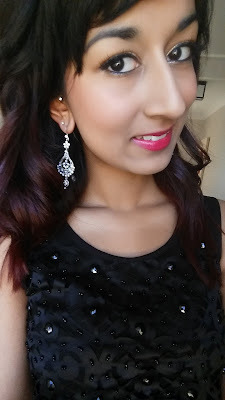 I also wore a pair of Manicare glam lashes - super comfortable, easy to reply and they were the perfect style for a wedding without being too OTT! 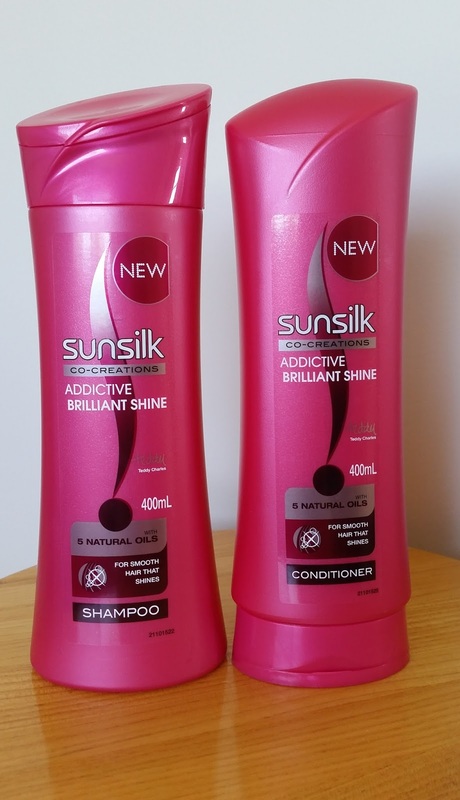 Sunsilk Co-Creations Addictive Brilliant Shine shampoo and conditioner*...phew, what a mouthful! So I have been sent these goodies to trial. These days, I am not really one to sway towards supermarket brand shampoos as I find it too drying/stripping on my balayage. However, this shampoo and conditioner have exceeded my expectations and I'm actually pretty impressed with them. For starters, the bottles are great. I find them really easy to use and they're massive too! The shampoo and conditioner both smell pretty similar - I can't quite describe it but to me it smells like delicious berries. The smell is quite strong and is still noticeable the next morning for me. The shampoo is not overly stripping but still cleanses well. As for the conditioner, I was really surprised at how soft, hydrated and silky my hair was afterwards. I have been using these for the past month (alternating with my colour shampoo/conditioner) and so far I'm happy with how they are working for me. In conclusion, these are a great option if you're looking for something that smells amazing, is hydrating and won't break the budget! I'm glad that I was sent these as I've never really been particularly interested in Sunsilk, but these have certainly changed my mind. You'd have to be living under a rock if you didn't realise how much of a big deal beauty oils are. But how do certain brands justify charging criminal amounts for their oils? I've come to realise that it's all about the basics - cut out the fragrance, the fancy packaging and only stick to the actual ingredient you need - the oil itself. 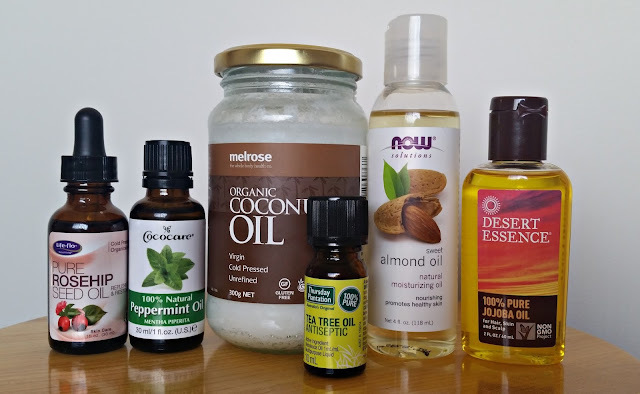 Lately I've purchased a few natural and organic oils for beauty related purposes, and its actually quite easy to find brands that won't charge you a killing for it. 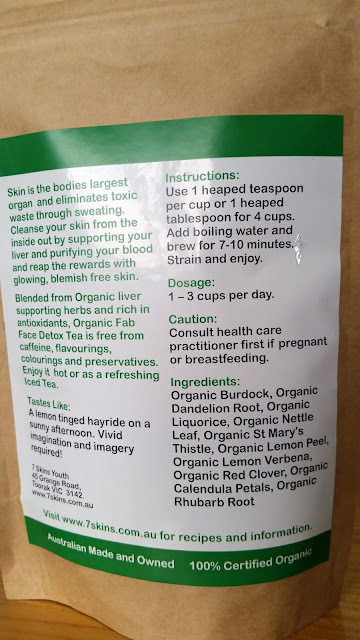 The website iherb.com has enabled me to do so. I've included links to products where possible. I'm sure you've all heard about the benefits of rosehip oil for skin. So I won't elaborate too much here. I was previously using the Sukin RHO which was great, but this one is 99% RHO and works just as well. And seeing as it only cost me $7, I'd say thats a win! Again, this is another oil that probably doesn't need too much introduction. I have been using this for years as a pre-wash hair treatment and it always helps to bring shine back to my hair! I bought this from the health/organic/gluten free section of Coles. So I had my tragus pierced a few months ago, and after having the bar changed, it formed a weird fluid filled bubble. Apparently this is very common with cartilage piercings, and a girl I work with suggested tea tree oil to help dry it out. I've been using it once a day after a saline cleanse and it has shrunk considerably in the past 7-10 days. I'd say in another week it won't even be visible anymore. I purchased this from work, but TTO can easily be found at most pharmacies. This was another oil I bought after watching the Farah Dhukai video. She recommends this as the carrier oil for peppermint oil. I don't really find it much different to coconut oil, and it probably isn't to be honest. But hey, for $4 I'm not complaining! I purchased this as I've read that it's good for skin. I'm actually a little too scared to try it because the bottle I have is 100%! I've been using it in my hair when its dry to give it some extra shine and thats been working pretty good. I'll have to work up the courage to try it as a moisturiser though. And that is my current collection! I'm curious to try argan oil and avocado oil next. If you've got any suggestions, leave a comment below! What sorts of oils do you have in your collection? I am happy to respond to companies/brands about products I have mentioned on my blog or for reviewing purposes. Lust Have It discount code!